Brian grew up in a household run by his grandmother who had been a doctor’s housekeeper. There was always cake in that house; one on the table for tea, one in the tin and one being prepared. This cake is one he reckons his grandmother would have approved of and has become his best cake recipe. Sometimes he stares at the shelves and says there is no cake and then he takes all the dried fruits out of the cupboards and sets to preparing the first part and I finish it off later. One of those joint efforts, that way he gets to choose exactly what goes in it; he avoids the ginger that I would put in and so on. I don’t know if this book is still in print but I’m sure you can get it secondhand – it’s a treasure house of useful advice, and good recipes and I am very grateful for this recipe. Our favourite fruit cake recipe ever – adapted from Sainsbury The Cook’s Companion – 1991 – by Joseceline Dimbleby. Scrub your oranges, zest the rind coarsely and squeeze the juice out. Measure the juice in a jug and bring it up to the 300 ml mark with rum or water. Warm the juice and the rum gently in a saucepan together with the butter and brown sugar until the sugar is dissolved. Stir in the zest and all the dried fruits. You can happily substitute other dried fruits if you have ones that you like better, I have made this on other occasions with crystallized ginger instead of pineapple, and with dried blueberries, Waitrose plum medley, all sorts of dried fruits, though I do think the prunes are fairly essential for the texture of the cake. Bring the whole lot to a gentle boil, cover and turn the temperature down and leave to simmer for fifteen minutes. Then remove the pan from the heat and leave it to cool. You can leave it overnight if that is convenient. Before mixing the final batter, preheat the oven to 180 degrees C, 350 degrees F. Grease a 18 cm (7 in) round deep cake tin or a 15 cm (6in) square deep one or similar. Line the base with a sheet of baking parchment. When you are ready to mix the cake, sieve the flour, bicarbonate of soda and spices together and then stir the sieved ingredients into the cooled fruit mix with a big spoon. Mix it all up thoroughly. Finally lightly beat the eggs and mix them in to the mixture last of all. Pour the mixture into the lined tin, and bake in the oven for about an hour and a half. Turn the oven down or cover the top loosely with parchment if you feel it is getting too dark. It is done when a skewer inserted into the cake comes out clean with no sticky batter attached. Let the cake cool in the tin for a short while – about ten minutes. Then turn it out on a rack to cool. As one is always advised with fruit cakes, leave it for a few days before eating. I have substituted ground hazelnuts for some of the flour one time which gave an extra delicious taste to this cake. The orange juice and the rum compensate for the sweetness of the dried fruits and it is a soft and moist cake which is very forgiving of variations in cooking time. I don’t like super sweet cakes and this is to my mind the perfect balance between acidity and sugar. When I was on Twitter earlier this year, I mentioned this cake and Carl said that it was always made for his birthday! So it’s one that has stood the test of time in many a home, not just ours. This entry was posted in Cakes, Sweet Stuff and tagged baking, Boiled fruit cake, Food, Josceline Dimbleby, Sainsbury's The Cook's Companion on 13/07/2011 by Joanna. Clever WordPress have done an ipad thing so the blogs look the way they do there. I can tweak the colours but that’s all. There is an option at the bottom to ‘view as standard site’. It makes all the blogs look the same, but it is smart. Very nice it looks too! Coincidentally I have a fruit cake on the go this very day, the fruit is soaking in a bowl with strong tea and orange juice so not unlike yours. I will finish it off tomorrow, and then keep it a few days to mature before cutting into it. I do find these type of cakes answer the problem of unexpected friends dropping in, and they are always welcomed by those who are offered them. I made a double batch of this one and gave some away. I even sent one up to the Cake District to my family recently, which was a bit coals to Newcastle, but it went down well. Nothing like a nice slab of dark fruit cake, though it is not very summerlike, when most people are thinking about summer pudding and ice cream desserts. Your version of the cake looks lovely; fruit cakes personalised to your own taste are so good! I have this book too – i should pay more attention to it, but there are so many books and so little time! They vary a lot, I think the ones with lots of glace fruits in are particularly sugary, if you keep those to a minimum then that reduces the sugar load a bit, though of course these cakes are full of fruit sugars as well as butterfat. Muscavado sugar, rum and a bucket load of dried fruit. ALL of my favourite things. It’s deadly if I make a fruit cake around here though, no one else likes it, which means me and self restraint are at odds. Muscavado sugar I find is a real pest to source around here…I would if Celia has a secret place that sells it…. ps. And I love that you both make the cake. Brydie, you can buy muscavado sugar at Essential Ingredient in Rozelle, but it’s really quite expensive. I’ve been using a dark brown sugar that I found at Southern Cross Supplies in Marrickville (where I buy the Ben Furney Mills bread flour) and it’s really really nice – quite a good sub for the muscavado I think, and about the same price as regular brown sugar. You do know the secret places ;) I knew it! That cake looks delicious. I do love fruit cake. I also love your Moomin cup. Summer is never when I make fruit cake- but why not, I’m asking myself. I’m going to make this on Friday. Josceline Dimbleby, whose recipe this is, says in the book that she makes several at the beginning of the summer for picnics as they keep so well, then she adds, that they never seem to last as long as she hopes, or words to that effect. I hope you like it Heidi! if your camily live in the Cake District, do you live in the Bread District?! Joanna, I love Brian’s fruitcake! When I first met Pete, he was living at university college, and his mother always sent him a fruitcake. It lived in his room all term, being eaten slowly. I love that most about fruitcakes, the fact that they last so long and are just there, ready and waiting for you to slice into them..
Mmm, boiled fruit cake! It’s been ages since I made one of these but this post has made me decide it will be the first thing I bake in my new place here in Canada. My mum made boiled fruit cakes a lot, and she always iced them with pink icing (just icing sugar, colouring, milk, and a little bit of melted butter). Not really traditional I guess, but it works! 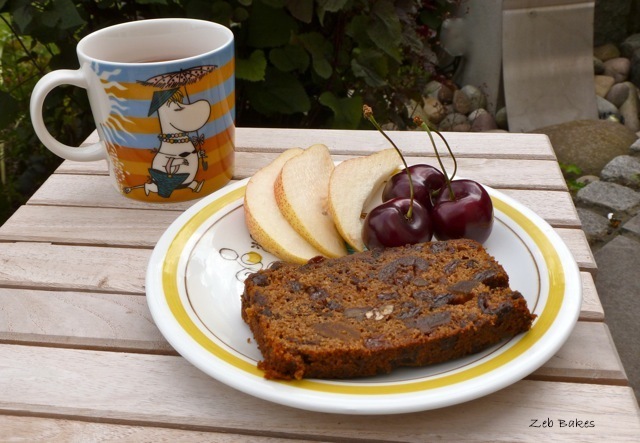 Peter does love fruit cake and I never make it – largely because I have a habit of falling face first into cakes – but I will make this one for our Christmas cake – and I do love your Moomin mug – it looks a little bit like me! Cool – Voguemin here I come! I would usually say I’m not a fan at all of fruitcake, but this looks and sounds delicious. Not sure hubby would like, but I don’t mind eating it all myself:) I have a food adventurous neighbor who would share it with me over tea. What do you use in your mixed spice? Since I love all things having to do with animals, I fell in love with that mug as soon as I saw it sitting behind that plate. So cute!! Hi Mel, this mixed spice is a blend of cinammon, ginger, something called ‘allspice’ which is a spice in its own right, maybe a little cloves and cardamom, mace, sometimes ground coriander. The BBC Good Food site suggest a blend here if you are considering making your own. The trick with fruit cakes is not to use the dried fruits you don’t like. Having said that prunes soaked in juice and rum are transformed from those things they used to give us at school…. So if you are not keen on currants, say, just substitute them with more cherries or golden raisins. In America, there are 10,000 jokes about how fruitcake has achieved eternal life – most of the jokes center around how no fruitcake is ever eaten here, it is simply re-wrapped and given to someone new each year. But, I’m sure they’ve never tasted your fruitcake! I personally enjoy fruitcake, but sadly, I think our youth hear the jokes before ever trying any, and carry the impression that fruitcake must be bad through their lives. How about, “Their loss, our gain.”? It might :) but on the good side, there is no creaming of butter and sugar, or whipping of eggwhites, or melting of chocolate, or piping….. This looks and sounds lovely. The low(er) sweetness makes it more appealing to me. All that fruit is sweet enough! I will have to make this…my family love fruit cake. Spice it’s a lovely cake and it slices quite thinly once it has matured for a while, so one can savour a little at a time. I am sure one could drop the sugar more, always worth experimenting.